Driven by specific extracellular matrix cues, endothelial cells can spontaneously assemble into networks. Cell network assembly is, in part, dictated by both substrate stiffness and extracellular matrix chemistry; however, the balance between substrate mechanics and matrix chemistry in promoting cell network assembly is not well understood. Because both mechanics and chemistry can alter cell–substrate and cell–cell adhesion, we hypothesized that cell network assembly can be promoted on substrates that minimize cell–substrate adhesivity while promoting cell–cell connections. 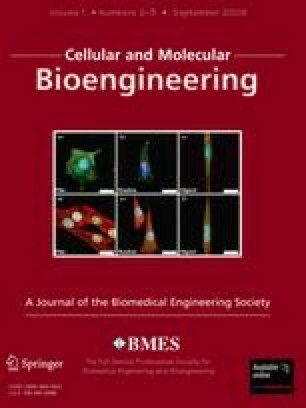 To investigate these hypotheses, bovine aortic endothelial cells (BAEC) were seeded on variably compliant polyacrylamide (PA) substrates derivatized with type I collagen and observed over time. Our results indicate that cell network assembly can be induced on substrates that are sufficiently compliant (Young's modulus, E = 200 Pa) and present significant amounts of substrate-bound ligand, and on substrates that are stiffer (E = 10,000 Pa) but which present less adhesive ligand. In both of these cases, cell–substrate adhesivity is decreased, which may enhance cell–cell adhesivity. Moreover, our data indicate that fibronectin polymerization stabilizes cell–cell contacts and is necessary for network formation to occur regardless of substrate compliance or the density of substrate-bound ligand. These data demonstrate the balance between substrate mechanics and chemistry in directing cell network assembly. We would like to thank Dr. Jane Sottile for her kind gift of Fn-free serum, pUR4B, III-11C, and helpful discussions.